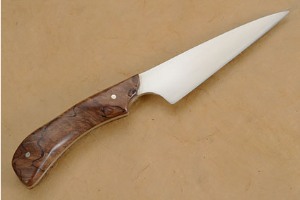 Blade height (at heel): 1.25 in. Description: Handmade by Jim Arbuckle, this utility knife is an excellent choice for the chef that wants a knife that is as attractive as it is useful. This piece is handmade and one-of-a-kind - there's not another one like it in the world! The blade is made from high performing, low care 154CM stainless steel and has an heirloom quality hand-rubbed satin finish. It was hardened and double tempered to Rc 58-59 for excellent edge retention. 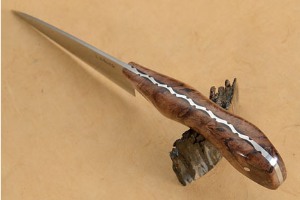 The blade is distal tapered to lighten it and create a perfect balance. The smooth spine moves into a serpentine fileworked tang. 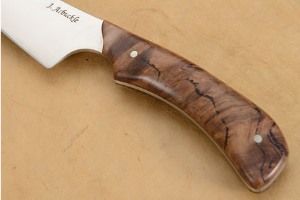 Eucalyptus burl scales are set on the full tang. By using stabilized wood, Jim ensures the knife will hold up well to the high demands of either a commercial or home kitchen. 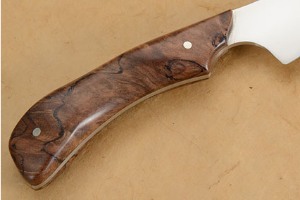 The handle is shaped with a deep choil or semi-circular cut-out in which the forefinger rests comfortably. 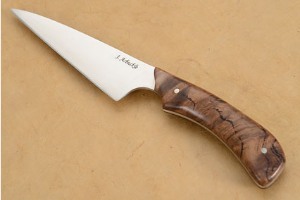 This makes the knife easy to hold and offers several different grip options. Excellent fit and finish throughout!